NAMI DC Family Support Group For parents and caregivers of children and teens with emotional, mental and behavioral health needs. Meet with family members who talk about mental health issues in an atmosphere of acceptance, respect, and mutual understanding. 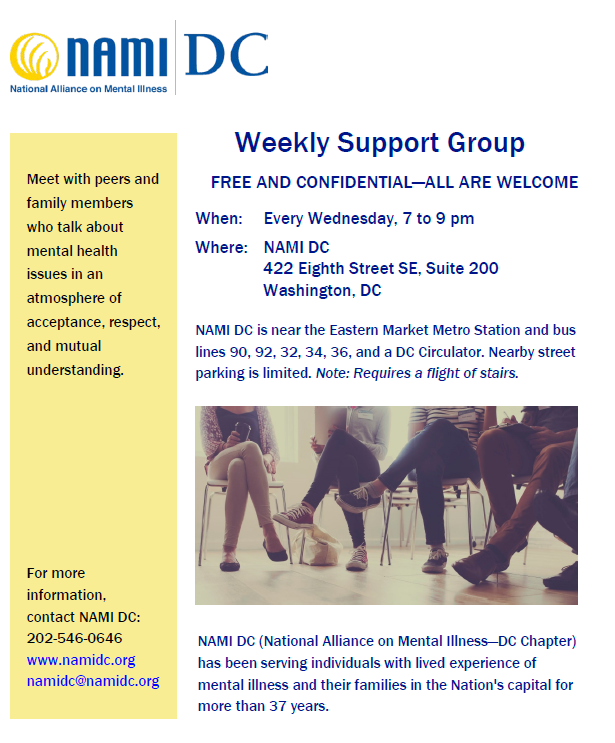 NAMI DC Family Support Group at the Psychiatric Institute of Washington. For Family & Caregivers of ALL Children 10 – 17 Years Old. Children do not have to receive care from PIW. Meet with family members who talk about mental health issues in an atmosphere of acceptance, respect, and mutual understanding. Meet with peers and family members who talk about mental health issues in an atmosphere of acceptance, respect, and mutual understanding. Where: NAMI DC Office, 422 8th St. SE, Washington, DC 20003 -- Requires a flight of stairs.